Know what you need before shopping for a vehicle. A car purchase, whether new or used, takes research and time to get the best deal. A rushed car purchase can result in a serious case of buyer's remorse and higher payments than necessary. Knowing what you want before you step onto the car lot helps you narrow down the options and drive home with the right vehicle. 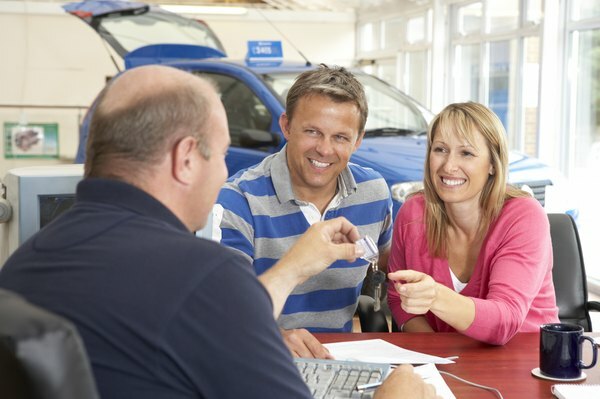 Several factors go into the purchase of a new ride, including the financing, condition of the vehicle and the local market. Calculate the budget available for a vehicle purchase and the source of the money. Determine how much cash you have for a down payment and the amount you can afford to borrow, if necessary. Consider the trade-in value of your car if you are trading it in, which can be estimated using Kelley Blue Book. Write a list of wants and needs for the vehicle if you don't already have a specific make and model in mind. Include the size, engine type and features you want based on your driving habits and how you'll use the vehicle. Read the automotive section of the newspaper or visit local dealers' websites to discover any sales or incentives currently offered. Visit local car dealerships that carry the type of vehicles you want. Many car dealerships have both new and used car lots so you can look at both if you haven't decided which way to go. 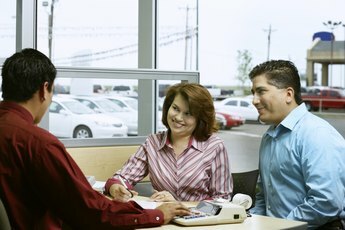 Tell the salesman that you only want to test drive vehicles and aren't making a buying decision that day. Resist the urge to buy on a whim based on pressure from the salesperson. Firmly remind him that you are only there to test drive vehicles and won't be making a decision that day. Inspect the vehicles you are considering on the car lot, noting any imperfections you see both inside and out. Get into the vehicle to make sure it is comfortable and easy to get in and out of, especially if it is a small vehicle or a tall SUV. Adjust seats, mirrors and the steering wheel to check for comfort and fit. Test drive the vehicles that best fit your list of wants and needs. Pay attention to blind spots and general visibility from the driver's seat, acceleration, handling, braking, comfort and smoothness of the ride. Test drive several vehicles so you get a better sense of comparison. Go home and discuss the vehicle options and the test drives. Compare the features of each car to your list of wants and needs. Decide on the vehicle, but don't fall in love with it in case the deal doesn't work out. Negotiate a fair price for the vehicle based on the dealer invoice price, which you can find online through sites like Consumer Reports in its New Car Price Reports. 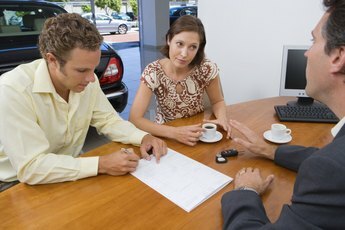 Make an offer that is between one and five percent above the dealer's cost, unless the vehicle is in high demand. Review the purchase agreement for accuracy before signing. Make sure all of the terms reflect the agreement you made, including any included fees. Clear up any discrepancies before signing. Consumer Reports suggests negotiating over the phone for a faster deal. You might also be able to better resist pressure from the salesperson if you aren't face-to-face.